I have always been a fan of baked oatmeal… grew up on it, make it often… but I am always interested in trying out new recipes. One of the blogs I read regularly lately is Life as Mom. She has a wealth of information on her site, plus runs another site called Good Cheap Eats. 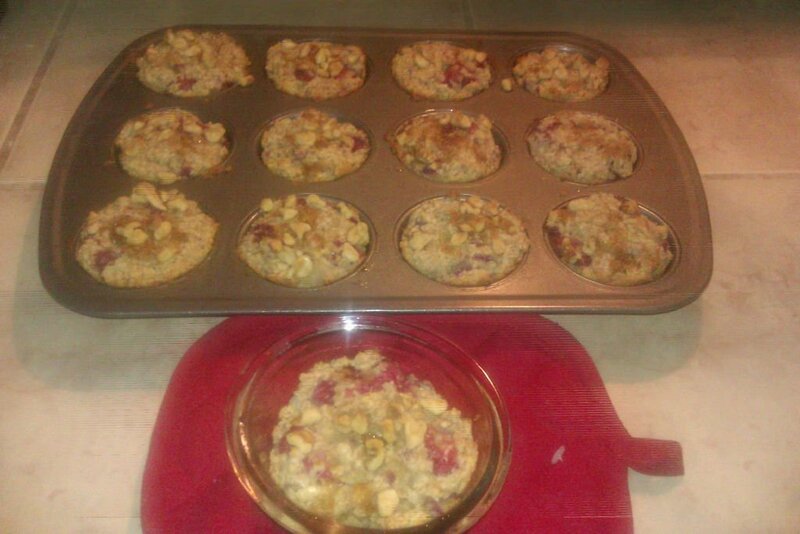 Today’s recipe spotlight comes from her, the very yummy Raspberry baked oatmeal cakes. Her original recipe is done in a normal 9 x 13, however, the cakes idea is from another of her posts that you can take a look at here. I had to make a few changes to her recipe… not because I thought there were issues with her recipe, but due to food allergies of the people living in my home, including myself. I whipped up a batch of pear sauce to substitute for the apple sauce, used goat’s milk for the cow’s milk and kiefer for the yogurt. That covered everyone with our weird allergies to foods. 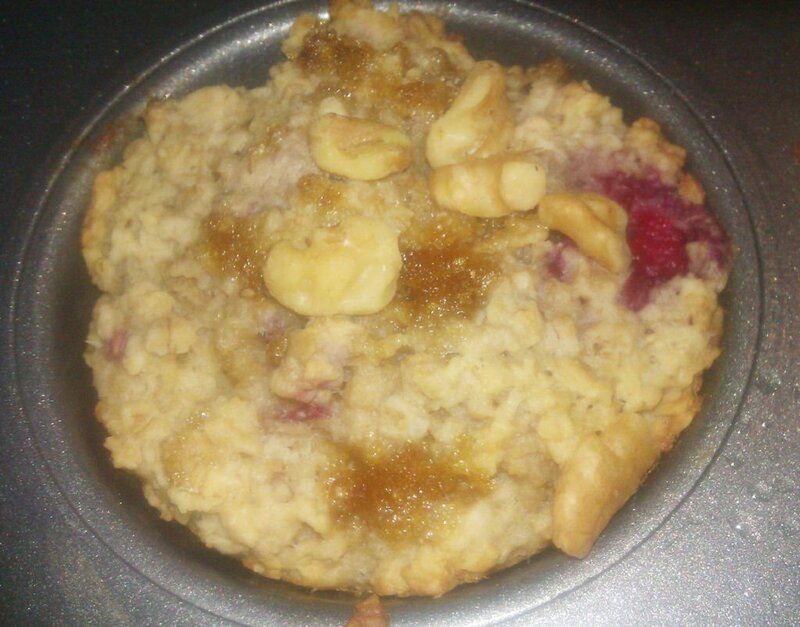 Raspberry Baked Oatmeal Cakes – Walnuts and brown sugar on top. All in all, I got 12 cupcakes and 1 10 oz ramekin with this recipe. Raspberry Baked Oatmeal Cakes – Hot out of the oven. This recipe is a good freezer recipe, which as you all know by now, I am a fan of. Just like Fish Mom, mine didn’t make it to the freezer. They were THAT good! They are quick and easy enough to whip up extra batches another time. I served this straight out of the oven with a dollop of goats milk honey Greek yogurt. 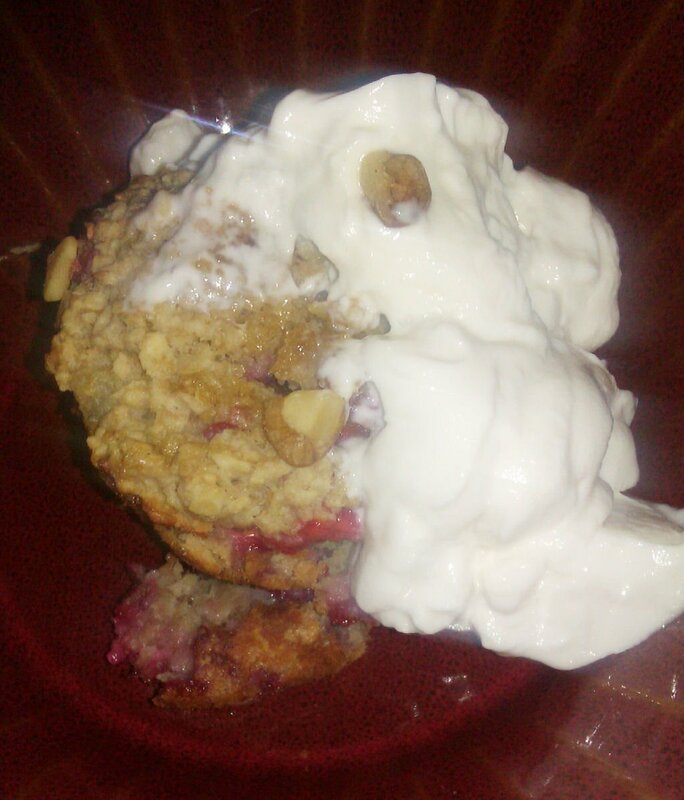 Raspberry Baked Oatmeal Cakes – Fresh out of the oven with a dollop of honey Greek Yogurt. I can imagine these being great with peaches… I think that will be the next version I make. Next ArticleSweet Potatoes, Bacon, Spinach…OH MY! That looks really good! Haven’t tried baked oatmeal yet, will give this a whirl with the pears.